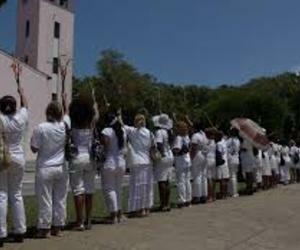 A video in which Ladies in White appears loudly expressing their opposition to the former member of the movement Alejandrina Garcia de la Riva, which surround and called her "traitor", learned Thursday in social networks. As reported by Radio Martí, the origin of the samples rejection is the differences between García de la Riva and the current leader of the organization, Berta Soler. The incident occurred in the house of the former group leader Laura Pollan, headquarters of the movement. The moment of tension that records video shows discrepancies between the members of the organization, some of which rejected the reaction of other women, who finished surrounding De la Riva demanding to leave the house. García de la Riva spoke to Radio Martí about what happened and said he spoke with Soler "about how he is leading the movement and perhaps what led her to act that way." Meanwhile, Soler told the station that the fact "is secondary" and avoided comment on images.